Today we’ve got a very special treat – the first creator interview from ONCE UPON A GEEK! Dan Mishkin and Gary Cohn, creators of the DC comic book characters Blue Devil and Amethyst Princess of Gemworld, were kind enough to spend some time with Ravenface and I discussing their creations. Dan and Gary are true professionals and a joy to talk with. We truly appreciate how generous they were with their time. They indulged all our fanboy questions and explained a lot of the inner-workings of the comic book industry. We talked about the characters, artists, the writing process, creator rights, proposed action figures, crossovers, and much more! I believe any comic book reader, even if you aren’t a fan of Blue Devil or Amethyst, would genuinely enjoy this interview. Dan and Gary did a fantastic interview about Blue Devil for Back Issue magazine two years ago. In that interview they discussed things such as: how they came together as a writing team; what inspired them to create Blue Devil; and what was it like working with artist Paris Cullins. It’s the holy grail of Blue Devil interviews, so we did not re-tread those same questions here. If you haven’t read that excellent interview, issue #21 of Back Issue is available as a digital download from TwoMorrows Publishing. Normally the digital download would cost you about $3, but they are running a special right now and this particular issue is FREE in PDF format. Go check it out! Our interview with Dan and Gary lasted an astonishing one hour and forty-one minutes (101 minutes). You may play the interview right here on the ONCE UPON A GEEK site with the handy-dandy player below! I apologize for not offering the interview in text format, but transcribing an interview that long would have taken months. Alternatively, you may download the file and listen to it on an MP3 player or your computer. You may download the interview by right-clicking here, choosing “Save Target/Link As”, and selecting a location on your computer to save the file (48.5 MB). Thanks for stopping by and I hope you enjoy the interview. If you are in the Michigan area, please try to attend the Kids Read Comics event in Chelsea, Michigan on June 12-13. Dan has been heavily involved with this event and it sounds really special. You can read more about the Kids Read Comics event on their website. This will do it for BLUE DEVIL WEEK! Thanks to everyone for reading! Long live Blue Devil and Amethyst! Very cool! Can’t wait to download and listen. Congrats! You know, I hadn’t added this site to my blog roll when Google started allowing the following of sites because I wrongly assumed it only covered Blogspot pages. 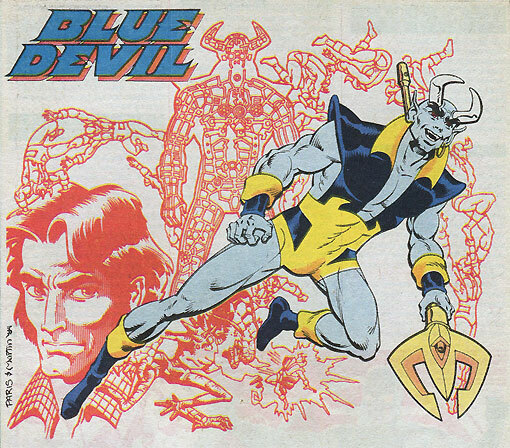 I thought to check out your current offerings when I was looking at the Justice League cover recreation you referenced, only to find you had devoted a whole week to a childhood favorite of mine, Blue Devil. I swear to God I had no idea this was going on when I did my Firestorm/BD ad post– I was just trying to catch up on my DC Challenge scans and needed ballast to fill out the week. Anyway, I enjoyed the interview, as it gave me something to listen to while I was preparing moving boxes. Shag’s got a great radio voice– very professional sounding. I confess to never having made the She-Ra connection, but it makes perfect sense on reflection. I still own a few of those toys, so maybe heart can be taken in the fan appreciation of the Amethyst knock-off. I hate to sound nasty, but I’m really glad “Midnight Blue” never got off the ground, as it sounds just as awful as what DC actually did with Blue Devil following “Underworld Unleashed.” I really do think BD brought the fun back to comics, so turning him grim ‘n’ gritty is the exact opposite direction I’d care to see him taken in. If only he’d been inducted into the JLI, he would have made it almost another decade before someone killed/ruined him. You and Ravenface did a great job in the interview. I’d certianly be interested in the mail order idea that was bandied about at the end of the interview. 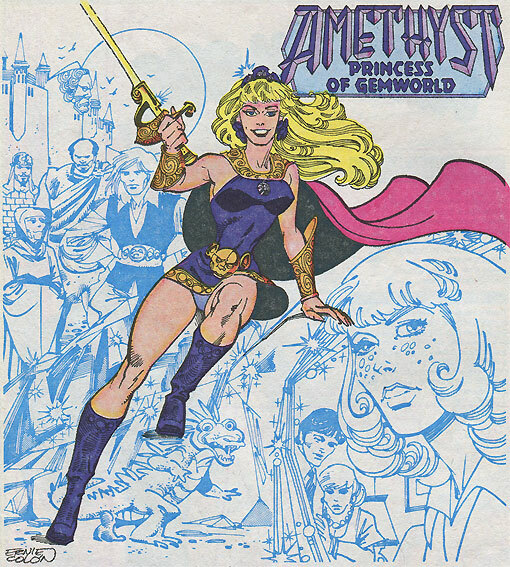 I can’t believe that DC hasn’t collected Amethyst into a trade paperback. I’d buy it, and I’m not exactly the target market for it. Rob/Frank/Choco – Thanks for the kind words! We had a real blast recording. Dan & Gary were super nice. Great guys with really interesting stories. And Frank… i totally agree, Blue Devil should have been in the JLI from the beginning. He would have been brilliant. I’m so glad Dan told me about this! It’s so good to know I’m not the ONLY Blue Devil fan out there… I’ll be adding you to my blogroll as well.